Sidney William Grey was the youngest son of the veteran photographer Stephen Grey (1822-1891). Sidney Grey was born in 1873 [ birth registered in Brighton during the Second Quarter of 1873]. Like his three older photographer brothers - Charles Stephen Grey (born 1854), George Elijah Grey (born 1859) and Walter James Grey (born 1865) - Sidney Grey worked as a photographer's assistant in Stephen Grey's studio as a teenager. When the 1891 census was taken, Sidney was the only son living with his parents at the family home at 32 Caledonian Road, Brighton. 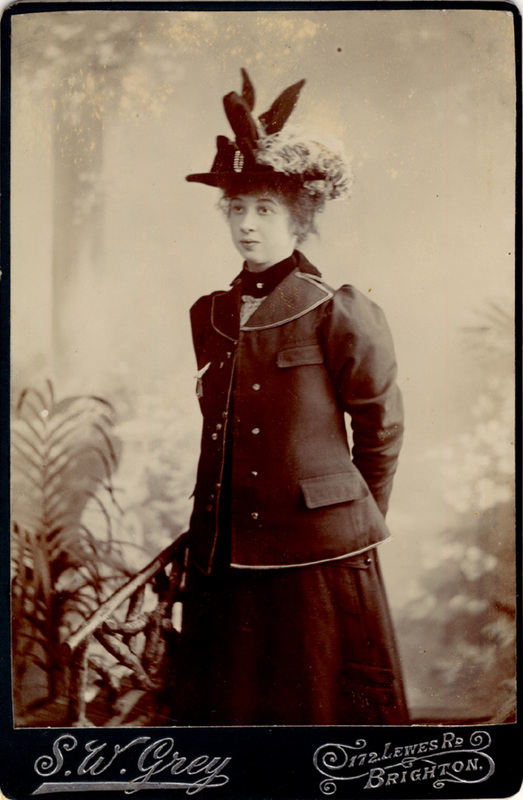 Sidney W. Grey is described on the census return as a "Photographer's Assistant", aged 18. By this date, all three of Sidney's brothers had married and, in the case of Charles and George, had established photographic studios under their own names. Walter Grey was possibly working as the main photographer in the studio of Stephen Grey & Son at 32 Caledonian Road during this period. In 1891, Sidney Grey was probably assisting his father and brother at the family studio in Caledonian Road. On 29th April,1891, shortly after the 1891 census was taken, Stephen Grey died in hospital following an operation to treat a strangulated hernia. Walter Grey did not want to pursue a photographic career, so Stephen Grey's studio at 32 Caledonian Road passed into the hands of his youngest son, Sidney, who was only eighteen year of age. Sidney may have only remained at No 32 Caledonian Road for a brief time - the studio is not listed in trade directories after 1892. A carte-de-visite dating from around 1892, gives details of "S. W. Grey, Photographer" at an address in Caledonian Road, Brighton ( the number of the premises has been erased and inked over with another number, which looks like a number "5"). Presumably, Sidney Grey worked as a photographer throughout the 1890s, yet his name does not appear as a studio proprietor until the publication of Kelly's Directory of Sussex in 1899. In adult life, Sidney preferred to spell his name as "Sydney W. Grey". In Kelly's 1899 edition of the Directory of Sussex, Sydney W. Grey is listed as a photographer at 172 Lewes Road, Brighton. 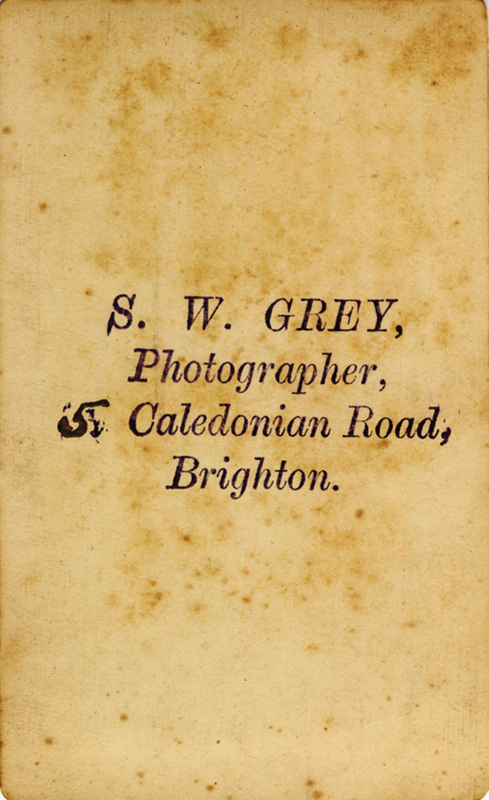 Pike's Brighton Directory of 1900, names the proprietor of the studio at 172 Lewes Road as "S. W. Grey", and it is this form of Sydney's name that appears on the majority of his photographs. 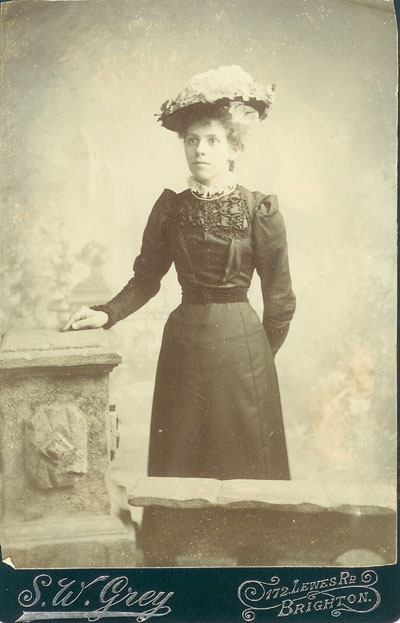 In 1901, Sydney William Grey married Madeline Sarah Gorringe (born 1879, Brighton), the daughter of Annie and Harry Gorringe (1840-1892), a Brighton bootmaker and shoe shop proprietor. [ The marriage of Sydney and Madolin (Madeline) Grey was registered in Brighton during the Third Quarter of 1901 ]. Sydney W. Grey operated the photographic studio at 172 Lewes Road until the end of the First World War. ( S. W. Grey's studio is listed in trade directories issued in 1918). By 1921, S. W. Grey�s studio at 172 Lewes Road was in the hands of the London photographer Henry Brabazon. [ABOVE] The reverse of carte-de-visite showing the details of S. W. Grey's studio in Caledonian Road, Brighton (c1892). 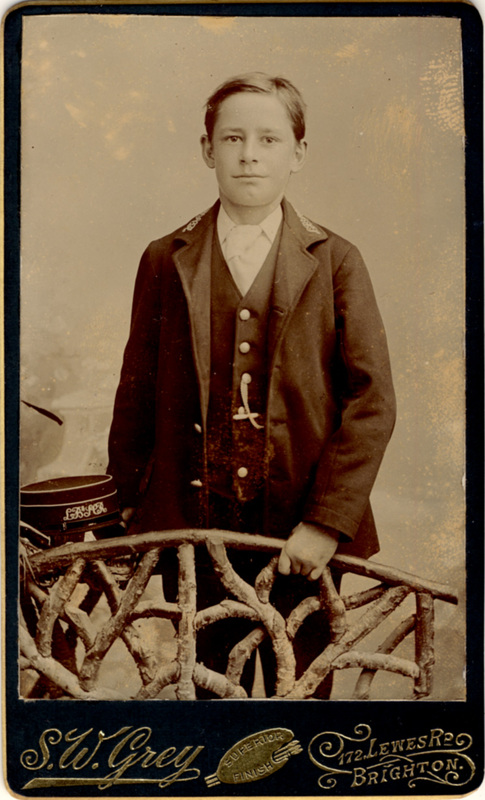 [ABOVE] A carte-de-visite portrait of a young railway employee in the uniform of the London, Brighton and South Coast Railway (LB&SCR) by S. W. Grey of 172 Lewes Road, Brighton (c1900). 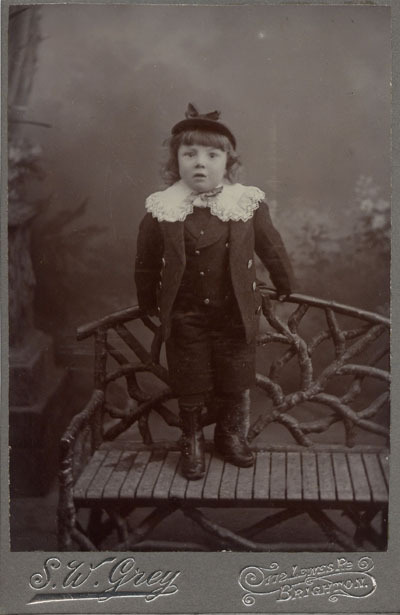 [ABOVE] A carte-de-visite portrait of a young boy by S. W. Grey of 172 Lewes Road, Brighton (c1907). 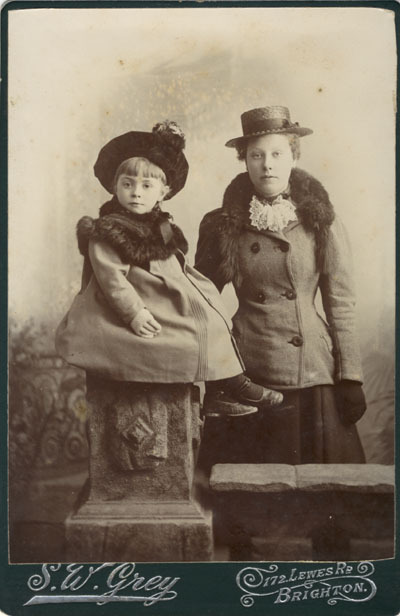 [ABOVE] A cabinet portrait of a young woman and a little girl by S. W. Grey of 172 Lewes Road, Brighton (c1905). In the early 1900s, a kitchen maid, like Sarah Ellen Jarrett (pictured above), earned around �26 a year - equivalent to a wage of 10 shillings (50p) a week. In this period a single cabinet portrait could be bought in a standard studio for about two shillings (10p), but it was common for customers to buy multiple copies to reduce the unit cost. For example, a photographer who charged 2 shillings for the "first copy", would offer six copies of the same portrait for 6 shillings (30p). Studios would also provide one cabinet portrait, plus six smaller identical portraits in carte-de-visite format for about 3s 6d ( 17.5 p). 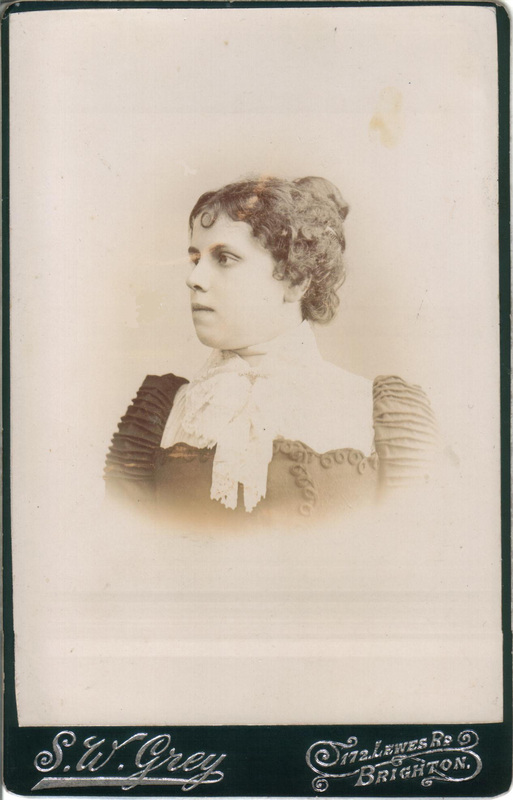 If we assume Sarah Ellen paid between 2 shillings and 3s 6d for the photographic portrait taken at S. W. Grey's Lewes Road studio, she was spending a sizeable slice of her disposable weekly income. To get some idea of comparable values - the best seats at the Empire Theatre Music Hall cost 2s 6d ( the cheapest price would be 2d for a place in the theatre's gallery ). Two pairs of silk stockings would cost 3s 10d. A pair of new court shoes would cost 5s 11d ( a second-hand pair of shoes cost around 2s 6d ). 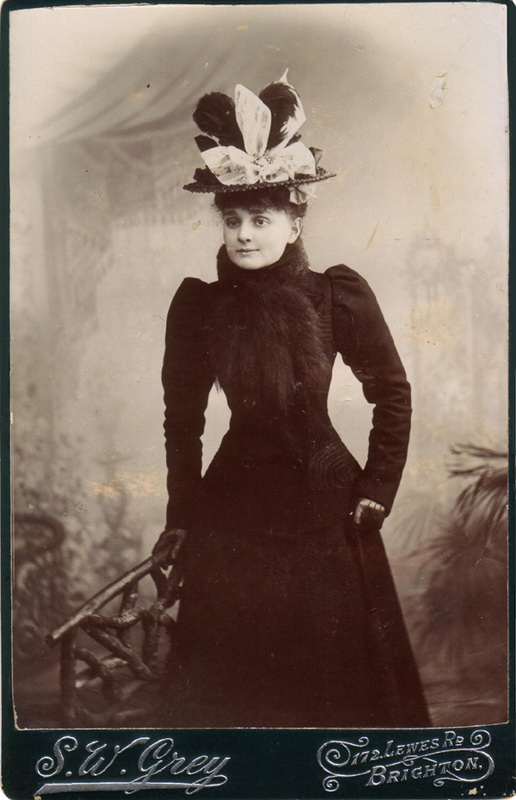 In other words, for a domestic servant to have a portrait taken at a professional portrait studio was a special occasion or "treat"- the equivalent of buying a new fancy hat or a good pair of silk stockings. As Sarah Ellen was living far from home, the portrait sitting was not so much an indulgence, but a nice way of reassuring her relatives (and young daughter) in Oxfordshire that she was keeping well and doing fine in her position in Hove. 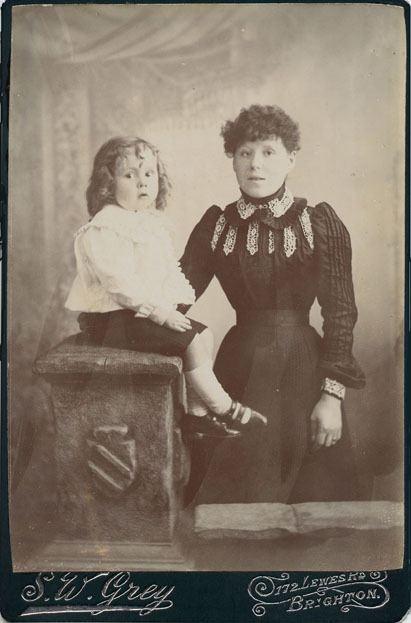 [ABOVE] A cabinet portrait of a woman and a young child by S. W. Grey of 172 Lewes Road, Brighton (c1902). 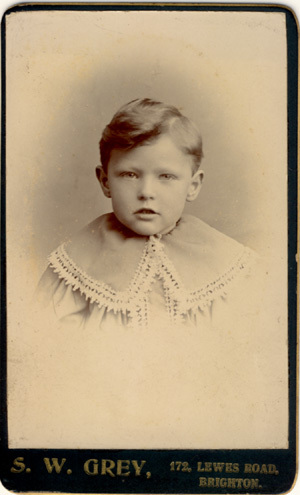 [ABOVE] A cabinet portrait of a young boy by S. W. Grey of 172 Lewes Road, Brighton (c1907). 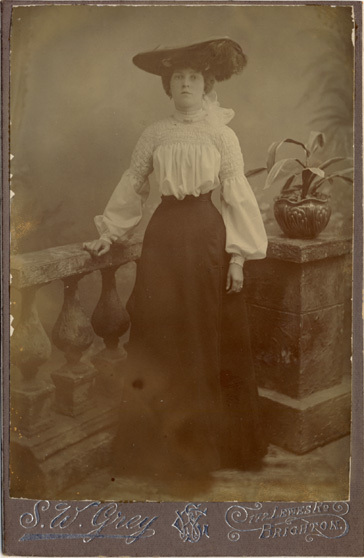 [ABOVE ] A cabinet portrait of a young woman by S. W. Grey of 172 Lewes Road, Brighton (c1905). [ABOVE ] A cabinet portrait of a young woman by S. W. Grey of 172 Lewes Road, Brighton (c1910). [ABOVE] A cabinet portrait of a young woman by S. W. Grey of 172 Lewes Road, Brighton (c1905). Thanks to Gill Clayton, a great, great grand daughter of Stephen Grey, for providing additional information on Stephen Grey's family. Thanks also to Alan Fry of Lincolnshire for extra information on Stephen Grey's family. Alan Fry is a great, great grandson of Stephen Grey. Alan's great grandmother was Elizabeth Annie Grey (aka Anne Elizabeth Grey), one of Stephen Grey's daughters. Elizabeth Annie Grey married Elias Richard Patching (1857-1889) in 1884 and together they ran The Bridge Inn at Upper Beeding, where Alan's grandmother was born in 1885.